This day brings back memories: this is the birth day of Lenin. Memories - because it was celebrated very loudly when I was growing up in the 1970s. Good or bad, my country of birth is Soviet Union, now non-existent. Western publicists love to muse about Communism, even though most of them have no idea what it is or was, theoretically or in reality. Karl Marx was a great economist after all. Some things about that country were bad, really bad, like freedom of speech, bureaucracy, censorship and low living standard. Some were good and even great. There is no honest way to get rich, so many people channeled their energy into education and culture. Overall general knowledge of the average Soviet citizen was way above that of an American. 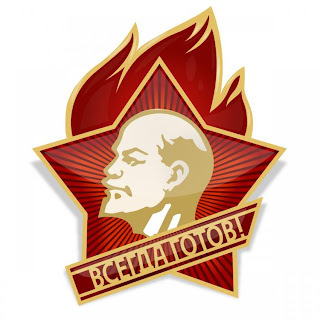 I received my education in USSR - for free, mind you, and it was good enough to be able to get licenced in two foreign countries: South Africa and Australia. I am not missing Soviet times, but it was my childhood and I feel... gentle on dates like 22 of April, 7 of November, 5 of December or 9 of May. My childhood was happy and bright, no matter what is currently fasionable to say about those times. Where was I. Ah, the workout.